All preppers should strive to be more like squirrels. Hiding your preps away from view, especially your most vital prep of all…water, is a necessity. Even if you have a big pond and/or a creek that runs through your property, never take the seemingly ample supply of water for granted. A drought or some type of contamination (accidental, environmental, or intentional) could decrease or deplete your pond or creek, and leave your family with no means of quenching their thirst after the SHTF. Collecting rainwater in barrels should be a commonplace activity around your survival retreat or bug in location, but leaving the bounty in plain site of prying eyes is dangerous. Would you leave your thousands of rounds of ammo and weapons cache sitting out on the porch for all comers to view? I didn’t think so. Water should be stockpiled for drinking, cooking, for cleaning and hygiene purposes. The common cold and other diseases will quickly spread during a long-term disaster, keeping the survival retreat and body thoroughly clean should help reduce the chances of germ spreading. 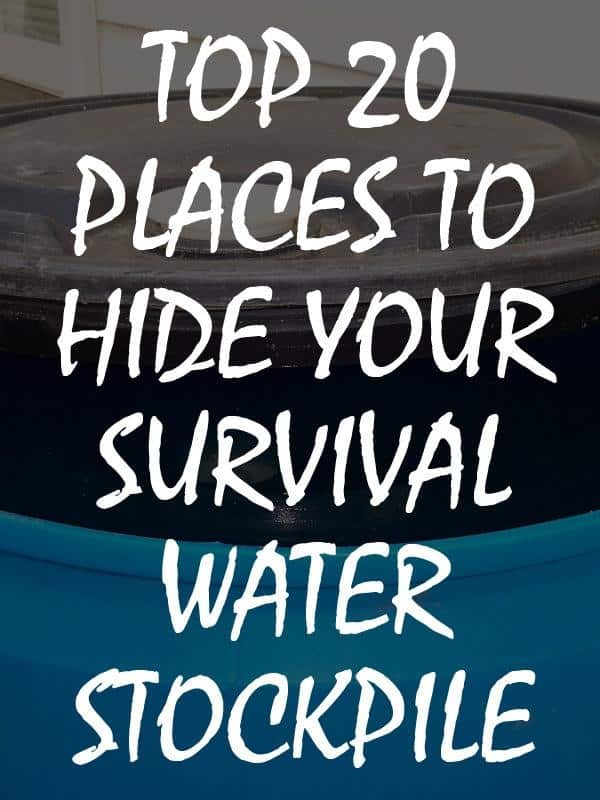 Storing your survival water stockpiles in varying types of containers will give you far more options for hiding places. The marauding hordes may be looking for water barrel catchment systems attached to the home or sitting close by, or other commonly used containers. Choosing multiple types of storage containers will allow you to hide this valuable resource in places both large and small, and make locating it a lot more difficult for looters. When water is stored in plastic containers, make sure they are of the food grade variety, preferably the #2 HDPE BPA-free food grade plastic material. For best and safest results, always keep the water storage containers in a cool spot out of the sun and rotate the water supply every six months. These containers are relatively compact and easily portable. Most stackable water storage containers are made out of 90 mils UN rated plastic to make them as durable as possible without adding too much extra weight to carry. Water storage containers made out of opaque material should eliminate or reduce bacteria growth. This type of survival water storage container can hold almost enough drinking water for a single person for nearly four months – if the person drinks up to ½ gallon of water each day. The drums are approximately 23 inches in diameter and stand 3 feet tall. Adding a siphon attachment to the barrel will allow for easy access to the contents. A 55-gallon barrel typically comes with an O-ring seal to allow the drums to be stored outside or underground even during freezing temperatures, but leave expansion space inside the barrels when filling with water in regions where temperatures can dip below 0 degrees. Storing 16 ounce bottles of water by the case also make easy portable storage. Unlike the 5-gallon containers, the cases of bottled water are not so easily stackable. You can stack the plastic wrapped cases of water, but the towers are not very sturdy and will topple if stacked too high or are not housed in-between something both sturdy and heavy. The plastic bottles may puncture a lot easier than any of the above storage options. These hardy cans can be purchased in small amounts, or in 3-month and 1-year varieties. Typically, canned water has minerals added to the contents to increase alkalinity to increase the shelf life of the liquid. The small and durable pouches are perfect to store inside of emergency and portable survival kits and caches. They are commonly sold in American 4.227 ounce varieties to coincide with the amount of water per meal the American Red Cross recommends for emergency situations. Cardboard boxes are usually sold with four 5-gallon mylar bags that can be filled from your spigot or sink and placed back inside the box for easy packing and storage. The bags are also sold separately, and each include a spigot. Saving your empty milk, juice, and pop bottles to re-use for water storage has long been the most economical way to stockpile and store water for emergency use. However, you can never thoroughly clean the milk and juice ones to the point where they won’t have any bacteria left. Keep it near your bath tub and fill it up with water when there’s news of a water shortage. These are stackable bricks that can hold not only water but also dry foods or even ammo. Make a wood box the same dimensions of a square bale of hay and put a hinged lid on the box. Glue hay all around the box. Store water bags, plastic jugs, canned, pouched, or bottled water inside the box. Then, hide the water storage boxes amid the rest of your hay inside the barn fro safe keeping. Dig a pit large enough to store multiple 55-gallon drums filled with water. Put the water barrels or stackable water containers inside and fill in the hole. Start your compost pile on top of the water pit to hide your stockpile. 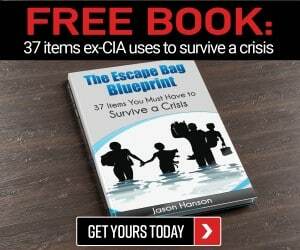 It is almost impossible to believe an attacker would think to look beneath a pile of livestock manure and kitchen scraps for your water supply. Weight down milk or juice jugs, or a plastic tub or cooler filled with cans, pouches, individual bottles, or bags or water and sink them to the bottom of your pond. Choose containers that will blend in with the pond bed and water, and duct tape them firmly shut before sinking them. 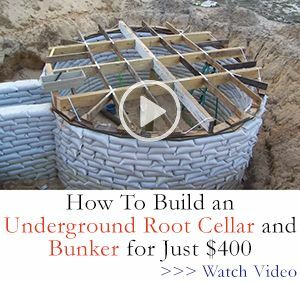 Make a survival cache out of PVC pipe and bury it underground or sink it in a pond to hide small amounts of water around your survival retreat. Hide single bottles, cans, and pouches of water in false floor boards around your home. Avoid the usual areas thieve would look, closet, like under the bed, a couch, dresser, or rug. Putting the false floor boards or wall panels near entryways and in front of kitchen cabinets. You can make a false front to the bottom of your kitchen cabinets, a false back, a false top, a false front floor panel, or a hidden void between cabinets to hide single bottles of water, water pouches, a water bag or bladder, or cans of water. Hide single bottles, pouches, or cans of water inside plant containers, flower beds, and herb gardens by burying them in the dirt. Only hide water in non-medicinal plant containers, a thief may steal your entire container if it holds growing food or medicinal plants. Buy or build your own covert furniture with built in hiding places to store water. Free or nominally priced plans for such furniture are readily available online. Unfortunately, such types of furniture have been widely advertised and may be a less secure hiding spot than some other options on this list. Build or buy wood bird houses and bat houses to hide small amounts of water inside. An attack would have to be absolutely starving to want to steal bird seed to eat. A desperate man or woman will likely browse your chicken coop and nesting boxes for eggs, but it is highly doubtful they would delve through the birds’ dropping to search for a hidden subfloor entry panel to get to hidden water bags and boxes. Bury 55-gallon drums full of water in a hole that is then filled in beneath your burn pit. Always keep some burnable junk in the pit to hide your secret storage spot as much as possible. If your survival retreat is in a rural area, build an outhouse and store stackable water storage containers beneath the floor and in a void between the opening in the seat and the box you build around it. Purchase a spare propane gas storage tank and allow it to remain empty once the fuel has been used up. Following proper safety precautions, drill a hole in the bottom of the tank and push single bottles of water up inside the tank to hide them before welding the opening closed and allowing weeds to grow around it. Making the tank looked as old, rusty, and as unused and empty as possible before hiding the water inside is highly recommended. Make use of what Mother Nature provides and hide small amounts of water inside hollow spots in upright trees and in hollowed logs. During months of the year when leaves are on the trees, paint a canvas bag to camo it and then tie the bag in a bushy part of the tree where it has the most bulk. On rural survival retreats, find a low lying area and make it your junk pile. On most rural properties, a pile of old metal and television sets in a ravine – one that is obviously a haven for snakes, exits. Put your containers inside old rusty junk and roll it down in the ravine – preferable multiple ravines, and hide it covertly in plain view junk no one will want to climb down and investigate. Channel your inner child and build a hidden room that you would have loved to escape to and hide in when you were a youngster. This would be a perfect place to store not only water, but long-term water storage food, an armory, and medical supplies. In almost every stick built home, about 3 and a half inches of empty space exists. Remove the drywall or paneling on the interior side of the walls to expose the studs. In between the wiring and piping, build narrow shelves to hold water bottles, water pouches, and cans of water. Add fake duct work around functional duct work to hide lightweight water pouches and other survival gear inside. You of course, cannot hide a swimming pool, but you can shield it from casual view with a privacy fence. The pool can be used as an additional water resource that will be difficult to steal, except by a single bucket load one at a time once the power grid ails during a SHTF scenario. A 12-foot in diameter, 3-foot deep swimming pool that can be purchased for around $100 to $150 at a Walmart type store, holds approximately 2,500 gallons of water. A 4-foot deep 16-foot in diameter swimming pool can hold about 6,000 gallons of water. If a family of four used five gallons of water per day, the pool would supply them with drinking water for approximately 40 days. A 20-foot in diameter 4-foot deep swimming pool holds approximately 9,300 gallons of water. Never, ever, hide all of your survival water stockpiles or other preps in a single location. Not only could that lead to easy theft if the hiding spot is discovered, but could cause you to lose all of your valuable preps if the home ever catches on fire. 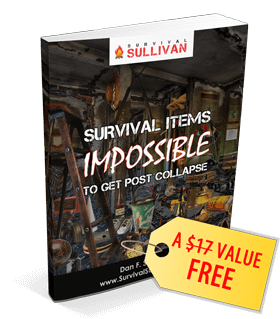 If one of your survival caches is discovered, it will lead the thief to believe more exist on the property. You and your loved ones, or members of your mutual assistance group, will need to train yourselves mentally to not give away the fact they are right or even glance toward an area where more water is stored. For the sake of safety, do not divulge the location of all the hidden survival containers to the entire group – no one can tell what they do not know. Instead, make a map of the cache locations, cover it in clear contact paper, put it in a fireproof and water proof lock box, and bury it. You will have to tell at least two people a lock box containing vital information is hidden in an certain area – be specific but not exact, so that it can be found in the case of your untimely demise. Next Could a Gun Ban Happen in the U.S.? You missed a very good water container – unscented beach jugs. Rinse these out and fill with drinking water. They work a lot better than used milk jug that you never can get fully clean and that the plastic is made to break down quickly. DB, It would have been a good idea to note bleach jugs specifically among the plastic jugs that can be used. They are definitely made of a sturdier plastic than most milk jugs. I personally hate using plastic anything, but sometimes it is nearly a must for storing preps. I use Mason jar to store most everything, but they can break and cost money to buy, so we stockpile plastic jugs to repurpose as well. Individual bottles of water are not a good choice for long term storage. Every single one I’ve tried “contracts” over time. I’m not sure why, except the contents are getting “smaller” somehow. It’s happened with Gatoraide as well. John, We have had that same problem with a few brands of single water bottles, but not all. I believe the quality – thickness, or the plastic used in the bottles themselves and the lids is making the difference. We tend to rotate the single bottles in and out after a few months and store them in our basement and garage where it is dark and cool, that seems to help, as well.